The Collinsport Historical Society: The Monsters (Cereals) are alive! General Mills has a little something special planned for this year's round of Monster Cereals. Boo Berry, Count Chocula and Franken Berry are going interactive in 2015. You'll be able to conjure your favorite sugar-enhanced monster at breakfast eavery morning with the aid of a smartphone app. Watch the video below to get an idea of how this special feature works. Expect to see a handful of variations in the packaging of this year's cereals. Target is selling exclusive packaging featuring a cut-out castle, while Walmart is offering glow-in-the-dark, cut-out masks of the Monsters. 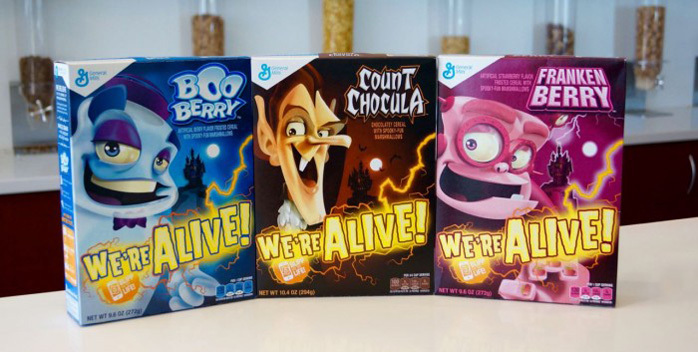 And good news for those of you in Canada: Boo Berry and Count Chocula will be returning to the shelves in the Great White North this year.